Caliche has been SOLD! Congratulations to his new owners, and best wishes for continued success! Email for information on others with similar training and potential. Caliche is a 1985, 14.2h, gray gelding by Gdansk (by *Bask) and out of Clover Bay. Trained first as a reining horse and then as a dressage horse. 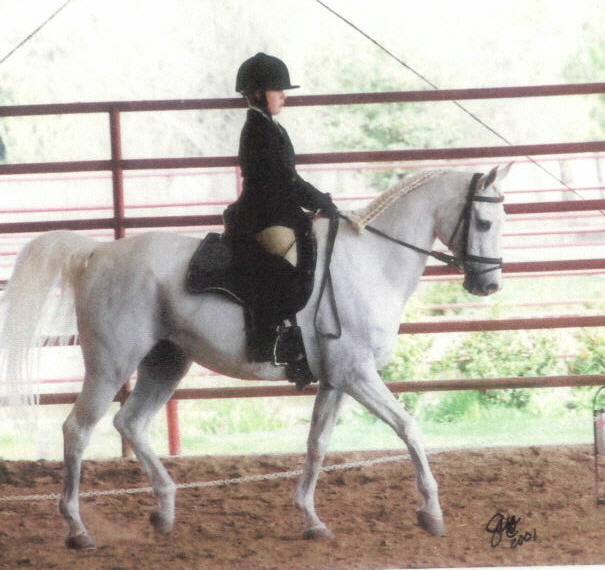 He won the First Level Dressage National Championship 13 and Under at the 2002 Youth Nationals. Ridden on trails and after cows too. He would be great for a small adult or child interested in having a show horse and riding horse. He is healthy and sound and certainly does not act his age. SOLD! 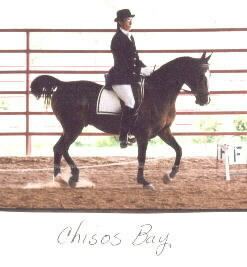 Czecher--1997,14.2 black gelding, Sweepstakes. Excellent potential junior rider horse. Quieter, easy going. Moves well and started over baby fences. Could go Open and/or Arabian. Priced under $10,000; Email for price. 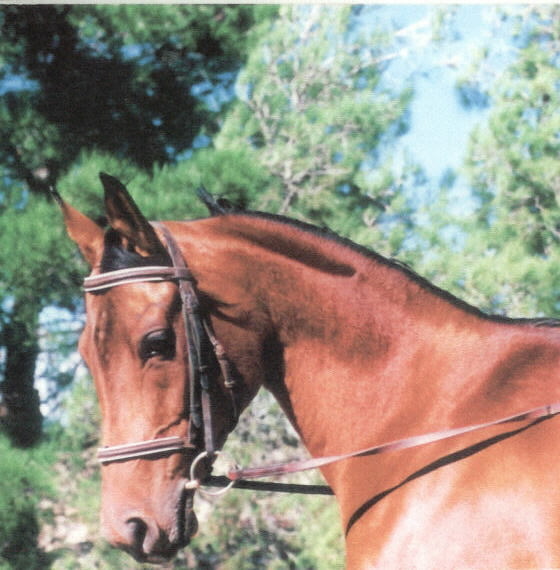 Joyeria--1997chestnut mare just starting under saddle. She is a full sister to Duelo, the 2003 Fourth Level ATR National Champion, 2004 Regional Champion at Prix. St. Georg. Very nice but only 14.2 at the most. Sweepstakes nominated. Excellent broodmare prospect. Priced under $10,000/usd; email for current price as she is continuing her training. Questa--1994 purebred bay mare--[pictured below]-- 14.1h; shown training level 4 and scored a 71. She is very talented, has lots of charisma in the ring, and also has an attitude. She has been put over a few low jumps and should do well in this area. Continuing her training--Email for price (under $10,000/usd). Also have some smaller mares that would make good sport ponies--email for further information.